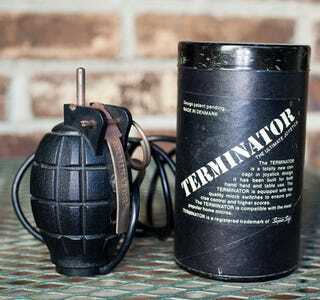 Terminator Grenade Joystick Trades "Pew Pew" with "Timmy, Nooooooo!!!" While the majority Atari 2600 users stuck with the standard, stiff joysticks, the most militant opted for the Terminator Grenade controller. Despite its unique, burly look, the Terminator was actually a standard, 9-pin controller that supported a variety of systems (including C64 and Vic-20). Today, it's both a fairly rare collectible and the only joystick that we wouldn't recommend carrying through airport security.